In Flames have released a lyric video for their new single Burn. The song will feature on the Swedish outfit’s upcoming studio album I, The Mask, which will arrive on March 1 through Nuclear Blast across the world and via Eleven Seven Music in North America. Vocalist Anders Fridén says: “We hope you enjoy Burn as much as we did writing it. It’s one of our favourites from the new album and the last song you’ll hear until the release date. 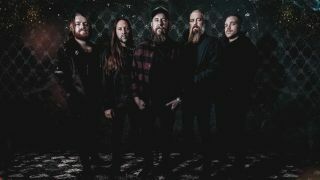 In Flames will head out on tour from April and also have several festival appearances scheduled. They’re also once again curating their own Borgholm Brinner festival, which will take place at Bornholm Castle on the isle of Öland, Sweden, on August 2 and 3. They’ll be joined by Opeth, At The Gates, Architects, Of Mice & Men and Witchcraft. In Flames will perform two different sets on each night.